There’s a knock at the door and you’re seized with panic. Not because of who it is, but because it’s 2:30 p.m. and you’re still wearing the clothes you slept in, your hair is matted to the side of your head, and your living room looks like a hurricane blew through it. You peek through the slats in the blinds and see that it’s your neighbor, dropping by to return something she’d borrowed. You’d love to open the door and invite her in for a chat and a cup of tea before the kids get home from school, but there’s just no possible way that you can let her see you, or your house, like this. So, despite the fact that you’re craving some neighborly camaraderie, you sneak away from the window, hoping she’ll just leave the dish on the porch or come back another time. 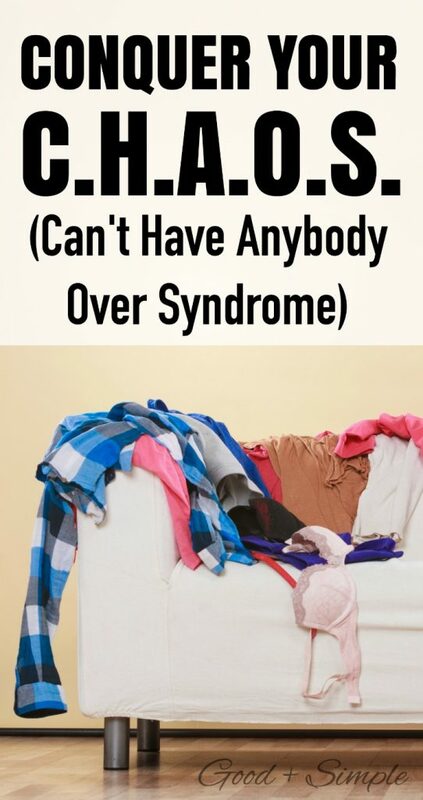 If you can relate to this, then you’re most likely living with CHAOS (Can’t Have Anybody Over Syndrome). I discovered this cute little acronym online a few months ago, and I thought it was genius. Unfortunately, I am very familiar with this syndrome. The bummer about it is that I genuinely love having people over. It’s always been my goal to have a warm and welcoming home that I can share with others. But, all too often, when I’ve been presented with impromptu opportunities to say, “Hey, why don’t you stop in for a bit?” all I can think about are the dishes in my sink, the pile of shoes by the door, and the weeds in my yard. This past year, I decided it was time to conquer my CHAOS. I started thinking about and writing down the things that made me feel hesitant to invite people over. Once I pinpointed what those things were, I began taking the necessary steps to correct them. And I was surprised to find that it didn’t really add much more work or busy-ness to my day. The great thing about conquering CHAOS is that it doesn’t require you to spend hours scrubbing your floors or dusting your ceiling fans. It’s more about having a simple system in place that allows you to be guest-ready most of the time, EVEN if your home isn’t picture perfect. 6 Steps to Conquering Your C.H.A.O.S. If you’re lucky enough to have a mud-room or another “out of site” place for shoes, backpacks, umbrellas, etc. then you are LUCKY. We go in and out via our front door, which became a dumping ground for everything that was brought inside or needed to be taken out. Shoes, backpacks, jackets, toys, mail, flyers, packages, bags of clothes for goodwill, etc. were cluttering it up all day, every single day. Those first few square feet of your home are the first thing, and often the ONLY thing that people are going to see! Guests aside, it stresses ME out to walk into my house and see a bunch of “stuff” as soon as I open the door. So I held a little family meeting to make it clear that we were not going to treat our entry way like a dump anymore. It took a few days of incessant nagging gentle reminders, but it finally started to work. 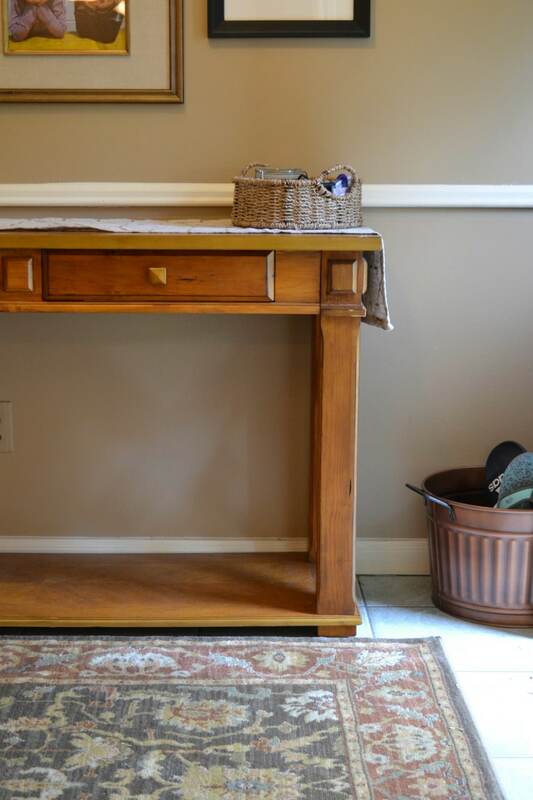 I added a basket by the door for shoes (which gets emptied every few days) as well as a basket to hold keys, outgoing mail, and other essentials. 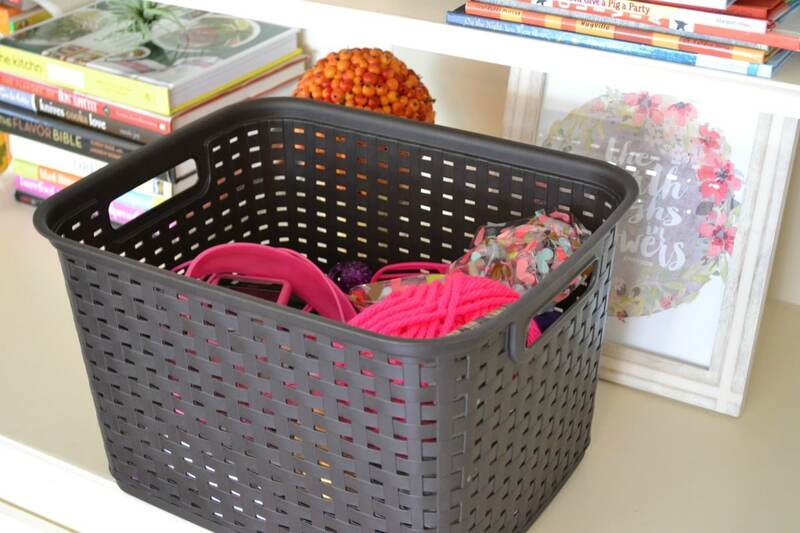 Anything that doesn’t go in one of the baskets must be put in its proper place as soon as you come inside. I also invested in making the entry way feel more welcoming by buying a rug for the floor and hanging photos on the walls. Our entry way is not going be featured in Better Homes and Gardens anytime soon, but it at least sets a pleasant tone when you first walk in the door, and makes me much more inclined to open that door in the first place. If you’ve got babies or toddlers in the house, this one might be difficult. But since my kids have gotten older, I’ve declared our living room a toy-free and clutter-free zone. At least this way, if somebody drops by or we want to invite somebody over, I know there’s ONE room in the house that will be relatively guest-ready. If the kids do bring something into the living room to play with, they know they are responsible for taking it right back out when they are done. If not, it ends up in the BORB, which leads me to my next step…. OK, this acronym’s not as cute as CHAOS, but it works. :) A few months ago I bought this little basket for a few dollars, and it is has been one of the best purchases I’ve ever made. I used to drive myself nuts picking up and putting away the little odds and ends that the girls left throughout the house. OR, I’d let the stuff sit out so that they could put it away after school, which meant I had to look at it all day, which also drove me crazy. The BORB has been awesome because instead of wasting my own time cleaning up my kids’ messes, I can toss loose cluttery stuff in there so it’s out of sight, and then have the girls clean out the BORB at night or on the weekends. It’s amazing how much neater the house looks when I do a quick run-through and toss stray belongings into the BORB instead of having them lying around on countertops, tables, etc. You don’t need to go overboard with your food supplies. Just stock your freezer with some easy “pop in the oven” frozen appetizers, and keep some jarred spreads/dips, nuts, olives, chocolates, salami, crackers, cookies, and other snacks in a special “guest-only” place in the pantry. It will make you much more likely to say “yes” to last-minute company. It’s not always easy to motivate myself to put on “real” clothes when a majority of my day consists of tapping away at the computer, running to the grocery store, and doing things around the house. But when I am dressed in something other than pajama pants, I’m so much more likely to want to socialize, even if it’s just inviting somebody inside for a few minutes to chat. If you still find yourself stressing out over the idea of having people over, remember why you want to have them over in the first place. Welcoming somebody into your home is an important way to connect, and to let people see the real you, even if the real you involves a few dirty socks in the hallway and a cereal bowl on the kitchen table at 4:00. Whenever I start to feel like my home isn’t “worthy” of guests, I remind myself how much I enjoy and appreciate being invited to others’ homes, and how the last thing I think about while I’m there is the cleanliness of their windows. Focus on the opportunity to spend time with others, face to face, and try to let all of your hang-ups and misgivings go. These are just simple little steps, but they can make a big difference in how you feel about your home, and your willingness to share it with others. If you’ve got anything else to add about conquering CHAOS, please do so in the comments below! I love this soooo much! Great ideas and really hit the nail on the head of the root of it all! Especially with number six. I don’t judge people and shouldn’t worry that everyone who may drop by is judging me like my mother-in-law lol!!! I am also reluctant to have people over if I don’t feel like my house can pass the white glove test, which is about 98% of the time. I truly have the best time at impromptu gatherings. It’s important to remember that true friends don’t care if there are a few dust bunnies flying! Great reminders!